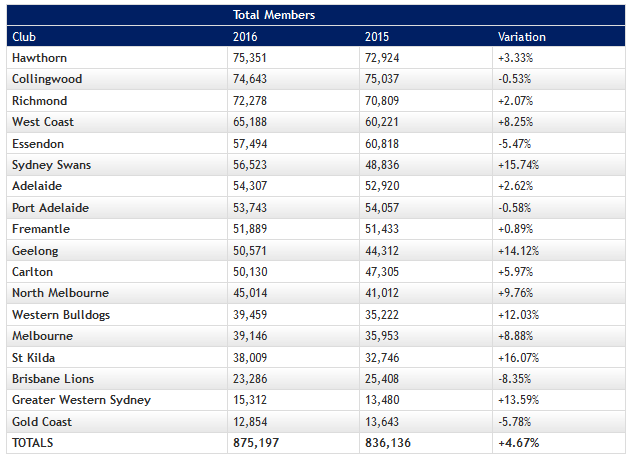 The AFL today announced membership totals for 2016. HAWTHORN has overtaken Collingwood at the top of the AFL membership ladder, riding a 3.33 per cent increase to a club-record tally of 75,351. Collingwood suffered a 0.53 per cent decrease compared to 2015, dropping to 74,643 members, but still sits second in the competition ahead of Richmond (72,278). The combined AFL club membership tally (as of July 31) hit record numbers for the 25th time in the past 26 years, rising by 4.67 per cent to 875,197. Thirteen of the competition’s AFL clubs recorded membership increases in 2016, with St Kilda (16.07 per cent), Sydney Swans (15.74), Geelong (14.12) Greater Western Sydney (13.59) and Western Bulldogs (12.03) leading the way. The Brisbane Lions suffered the biggest drop, failing from 25,408 members in 2015 to 23,286 this year, an 8.35 per cent decrease. Gold Coast (-5.78 per cent), Essendon (-5.47), Port Adelaide (-0.58) and Collingwood were the other clubs whose membership numbers dipped. The AFL has tightened membership regulations and to be counted as a member an individual must have a name, contact details, have contributed $50 to the club and received a membership pack. The official counts also include multiple memberships held by an individual. Pet memberships are not counted but the AFL confirmed babies and toddlers are included. In March, The Geelong Advertiser reported that the Cats were likely to breach the 50,000 member barrier. In April, Foxsports reported that West Coast fans pay the most and Essendon fans the least for membership – with an 11-game membership a whopping $235 cheaper than the most expensive: West Coast’s 11-game reserved seat package. In June, the Advertiser reported that Adelaide this had claimed “record” membership — 63,920. As far as the Crows are concerned, this mark topples last year’s all-time high count of 63,038 — a figure the AFL auditors knocked back to 52,920 (down on the record 54,249 in 2014). Port Adelaide was ready to declare it has reached the 60,000 mark — the count Friday was 59,910. Again, this will stand up to the AFL audit that last year was trimmed back to 54,057 — the first time the Power’s membership figure ranked higher than hometown rival Adelaide. The Heraldsun reported in June that Collingwoods place on top of the membership pile was under threat, with fellow Victorian power clubs Hawthorn and Richmond dramatically closing the gap this year. The Hawks and Tigers had grown membership by more than five per cent to break through the 70,000 barrier, while the Magpie army had reduced by more than 6 per cent. In July, North Melbourne announced it had set a new membership record. In August, the Heraldsun reported that AFL clubs were boosting membership numbers by including sponsors, community groups and schools. North Melbourne said it doesn’t have a membership deal with its sponsors while Geelong said it doesn’t give sponsors “bulk” memberships. Carlton, Collingwood, Essendon, Hawthorn, Richmond and St Kilda did not respond to direct questions about any membership component of their sponsorship deals or provide clarity on any community membership strategy. Western Bulldogs sponsor Victoria University offers all its students and staff a free, three-game Bulldogs’ home membership. The Bulldogs would not disclose the number of members in this category.